Zimbabwe President Robert Mugabe remained in detention last night at his home in Harare, after the military declared on national television that it had temporarily taken control of the country to “target criminals” around the head of state. The move by the armed forces appeared to have resolved a bitter battle to succeed the 93-year-old president, which had pitted his former vice-president Emmerson Mnangagwa, against Mugabe’s wife Grace. Mnangagwa was reported to have returned to Zimbabwe on Tuesday evening from South Africa, where he fled last week in an apparent attempt to clear Grace Mugabe’s path to power. 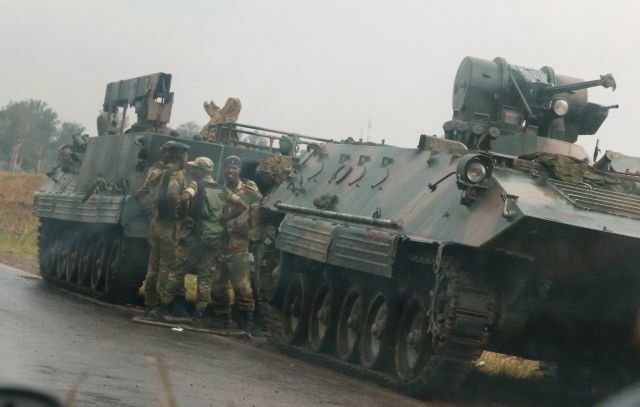 The military takeover came two days after the army chief said he wanted to end turmoil in the ruling Zanu-PF party. It is likely to signal the departure from power of the world’s oldest leader within days, weeks or at most months. One high-profile opposition leader said there was “a lot of talking going on”, with the army reaching out to them to discuss the formation of a transitional government after Mugabe steps down. The official said Mugabe would resign this week and be replaced by Mnangagwa, with opposition leaders taking posts as vice-president and prime minister. There was no independent confirmation of his claim. 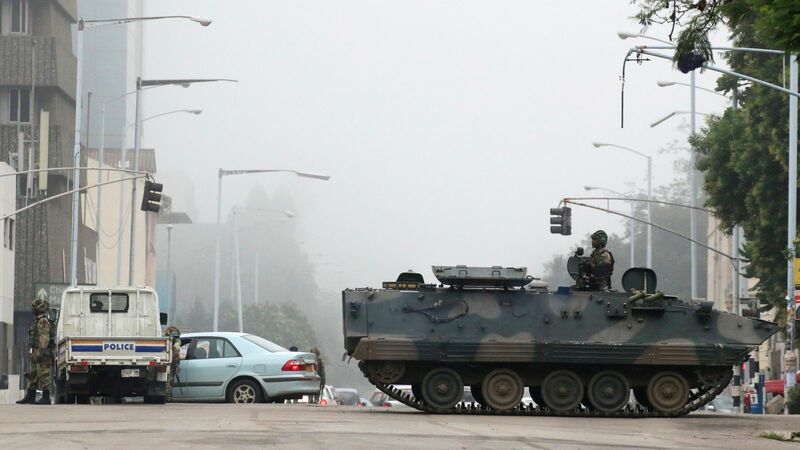 Zimbabwe’s fragmented opposition had not publicly condemned the military move. Nelson Chamisa, the deputy head of the opposition MDC party, called for “peace, constitutionalism, democratisation, the rule of law and the sanctity of human life”. Tendai Biti, an opposition leader, called for a “roadmap back to legitimacy”. “What is key is that a traditional authority is set up which is inclusive with the opposition and the ruling party … We need a dialogue too with [regional organisations], the African Union and the United Nations. We can’t solve this problem on our own,” Biti said. The 75-year-old former intelligence chief had been locked in a battle with first lady Grace Mugabe to succeed her husband as president. In October she publicly denied poisoning him after he fell ill at a rally in August. After his sacking, which was seen as an attempt to clear Grace Mugabe’s path to power, Mnangagwa fled to South Africa. He reportedly returned on Tuesday as the military prepared to take over the country, and is firm favourite to become Zimbabwe’s next leader. 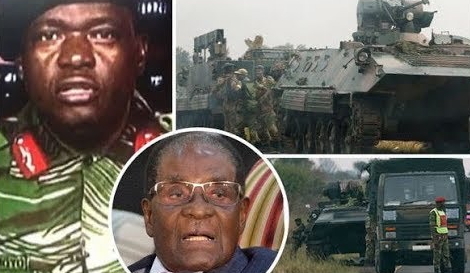 He has strong support within the security establishment and among veterans of Zimbabwe’s 1970s guerrilla war, when he earned the nickname “the crocodile”. 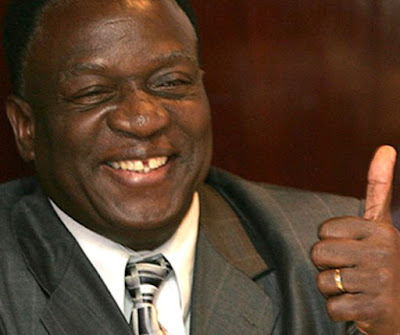 Despite his alleged involvement in atrocities in the 1980s, Mnangagwa is the preferred candidate of much of the international community, which sees him as being the most likely to guarantee a stable transition and implement economic reforms. South Africa sent ministers as envoys on yesterday morning. President, Jacob Zuma said in a statement that he had spoken to Mugabe, who he said had confirmed he was “confined” but “fine”. Zuma called for calm and a transition in line with the Zimbabwean constitution. 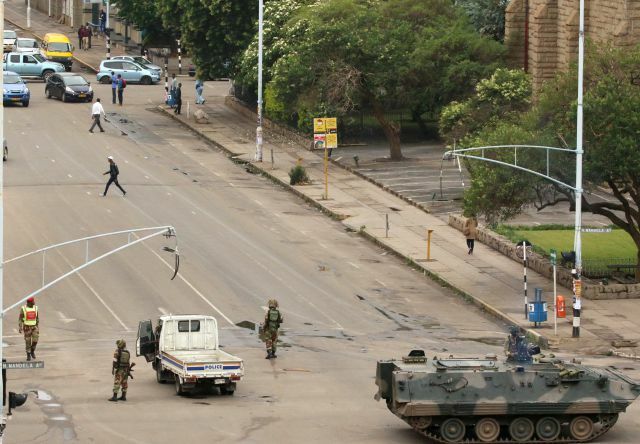 Soldiers have blocked access to parliament, government offices and courts in Harare, the capital, residents said. Access to the president’s official residence was also blocked by troops. But the city appeared calm. A military spokesman Maj Gen SB Moyo on state television said Mugabe and his family were “safe and sound and their security is guaranteed”. Troops seized the network’s offices late on Tuesday night.